Day 2: Morning came much too quickly for my taste. We ate the breakfast items we got from Whole Foods and got ready. 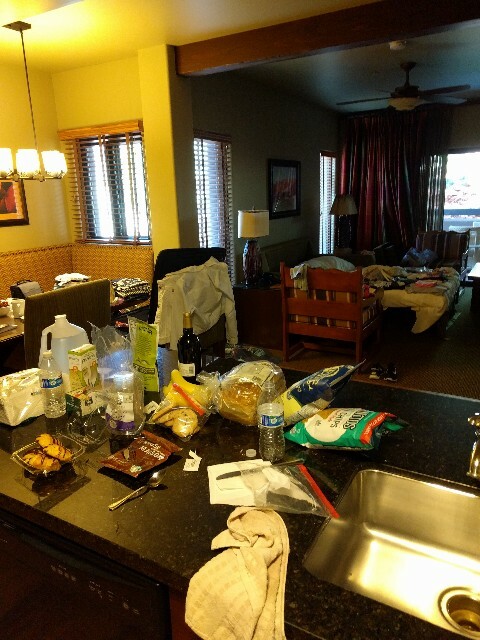 Somehow in less than fifteen hours the entire contents of our large suitcases had been strewn across our beautiful room. Our next overnight stop was the Grand Canyon hotel El Tovar. I knew from research that parking near the El Tovar hotel is not a given. The parking lot is very small, and not exclusive to the hotel. I figured we might have to take a shuttle bus from remote parking to the hotel. I also knew our room was on the third floor without an elevator. I thought because of this we would be better off with smaller luggage so we packed a carry-on and personal-item-size bag in preparation of our Grand Canyon arrival. We then headed down the road to Slide Rock State Park. 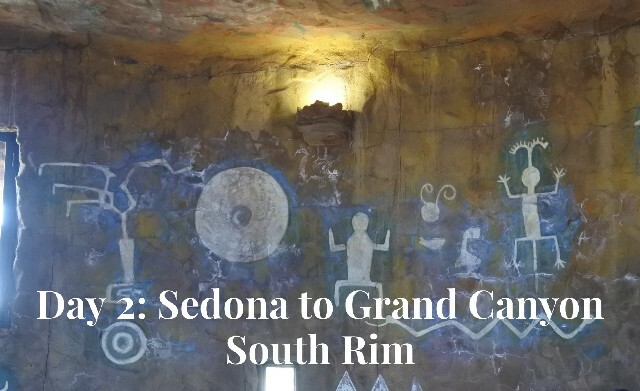 This first excursion out of Sedona was a really short drive, only 15 minutes to get there from the hotel. 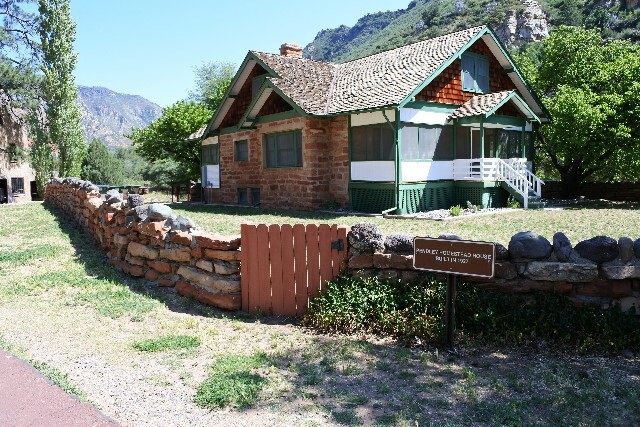 Frank L. Pendley first acquired the land in 1910 under the Homestead Act and by 1912 had developed an irrigation system and planted an orchard. 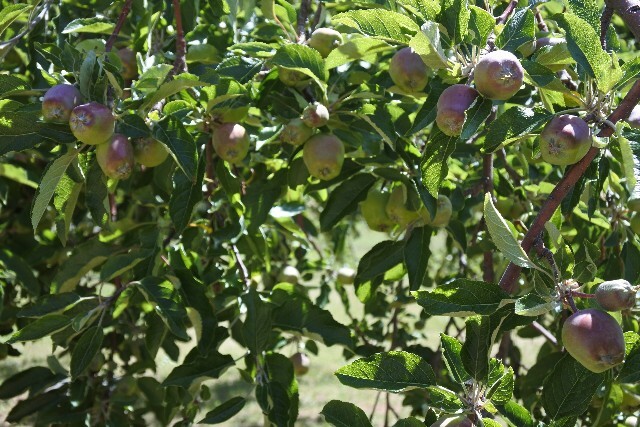 We were able to walk past his home and even see some of the apple trees with teeny tiny apples growing. There is a paved path until you get close to Oak Creek, and then you have to climb down some rocks to get to the water. 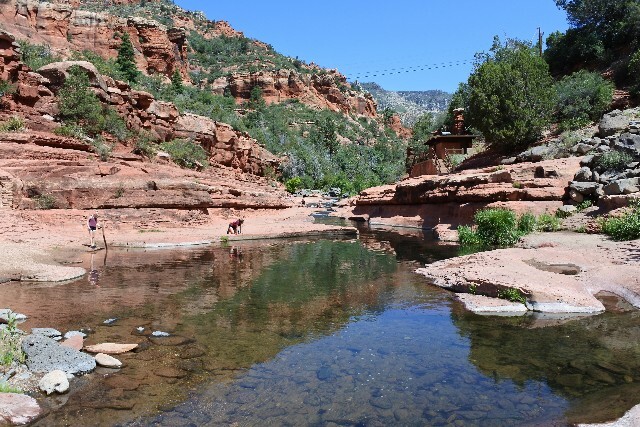 There is a part of the rocks that have been worn smooth by the water and this “slide rock” is where the park name comes from. It was only in the 60’s that day so no swim suits for us. We did see plenty of brave souls take the plunge! I had brought swim shoes for Elizabeth which was really helpful. My mom and I just went barefoot when we waded in. The rocks were very slippery, but it was so much fun to explore. The scenery was beautiful, the water was very cold and really clear (our feet are in the water in this picture!). 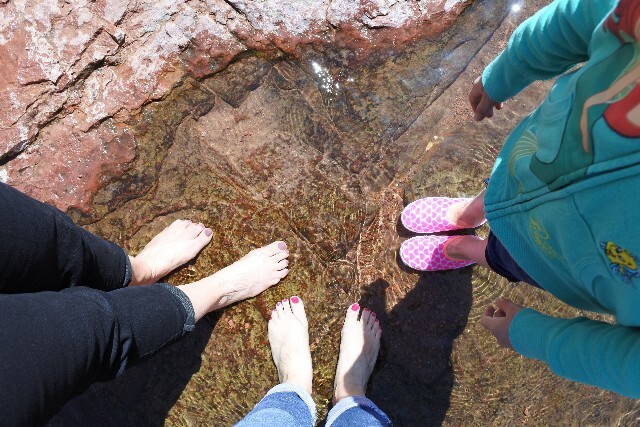 We had a great time just sitting on the rocks and dangling our feet in. Once we had played in the water for about an hour, the crowds started to arrive. We walked back up to the parking lot to grab the picnic lunch we had packed from our grocery trip. The three of us sat at a picnic table and enjoyed the scenery while we ate. Now it was time to hop back on the road toward Flagstaff. The roads were twisty, winding and looked nothing like the roads in the Midwest. We impulse stopped at a scenic overlook at Oak Creek Vista whose elevation is 6,240 feet above sea level. There were several Native American artisans set up selling crafts and jewelry. 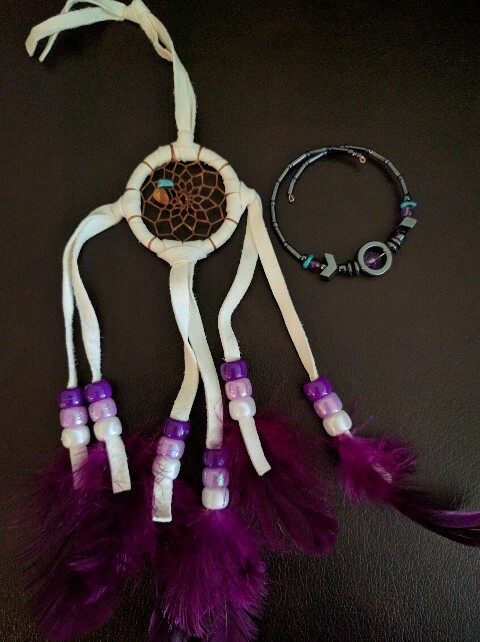 Elizabeth found a tiny dream catcher and a bracelet she liked so those were fun and reasonably priced souvenirs in addition to the photos we took of the valley below. 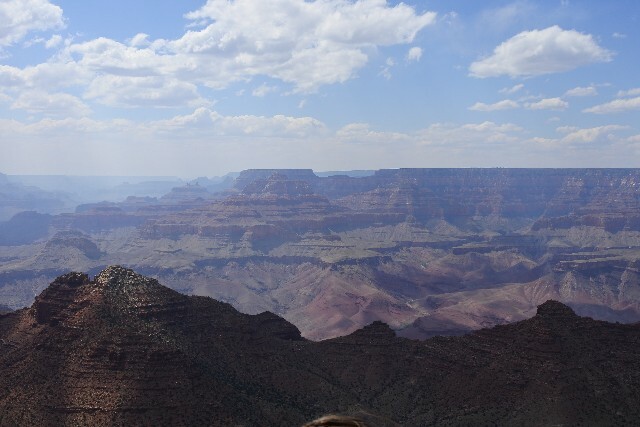 We went past Flagstaff and made our way toward Cameron to the east of the Grand Canyon. After leaving Flagstaff we lost cell phone service for the majority of the trip to El Tovar. It was like stepping back in time. It was a little scary as we drove through desert knowing that if we got a flat tire we would be without a way to call for help. We also didn’t know if we would have service in the Canyon so my mom called my sister to warn her. My sister is younger and does not remember the “old days” before everyone had cell phones. When we told her we might not have service for two days she panicked. “How will I call you in an emergency? !” We had to tell her in case of emergency you call the hotel landline and ask to be connected to our room. It was funny to have to review these classic techniques. Because of spotty cell coverage I also had purchased an atlas to help navigate us. This $9 investment was used a couple of times when we were living our retro existence. 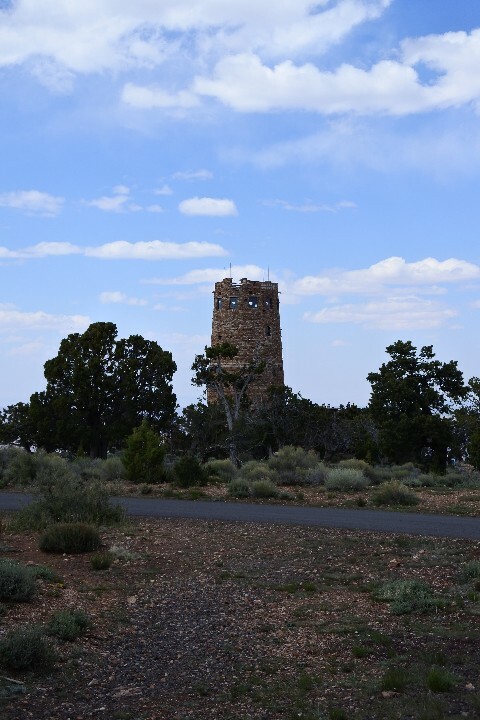 I wanted the first stop inside the national park to be the Desert View Watchtower which is why we took the less traveled east entrance route. We arrived, found parking easily and made our way to the Tower. It’s only 85 harrowing, narrow, crowded steps to the top of the tower, but well worth it. What a great way to show Elizabeth her first views of the Grand Canyon! Next, we made a quick stop at the Tusayan Ruins before arriving at El Tovar. I called the hotel (back in the Flagstaff area where there was mobile service) and they said we could park in front of the hotel while we checked in and unloaded. Parking looked like it would be a nightmare so I got my mom and Elizabeth settled in the room. When I went back out I used my Chicago street parking spot stalking technique and landed a space in the coveted lot. Yes! A quick dinner at Bright Angel Lodge Historic Harvey House Café was welcome after our long day. I ordered the Arizona Tom Turkey which was roasted turkey, stuffing, and mashed potatoes that had been on the menu since 1939. It was delicious, but huge. My mom and I could have probably split the meal. After that we called it a day and headed back up to the room. We needed to rest before our big hike in the morning.